Well, this has been an exciting month! I've now created a book basically journaling how I learned to sketch. Many people aren't even aware that there is a difference between drawing and sketching. Have you ever wanted to sketch down a moment in time? If you're like me and dedicated to drawing in detail, there is no possibility of capturing anything on paper quickly. I needed to figure out how to sketch so I studied lots of old art books and I learned bits and pieces from each one. These books are so old, I feel like I'm mining for gems in a field that's long been forgotten. Now I'm not one for any kind of negative talk so don't get me wrong when I say I'm not the best sketch artist there is. But, I am so excited with my progress! The realization came to me after months and months of poring over these books that I should gather all this information together for you, too. It has taken quite some time but now my whole learning process has been documented. The advantage of a reliable method is in knowing how we did a thing, and in being able to do it again. I also reveal all the little tricks and techniques that I have gathered from a gazillion old books. Anyway, after much fussing, my book was born. This is a hobby for everyone! My site is dedicated to showing you how easy it is to draw based on the path I took to learn. Since sketching is a different technique, I've made a book outlining a simple method to follow. Drawing skills are a bonus but they're not mandatory by any means. If you've struggled with drawing then maybe sketching is something you need to try? Opportunities are open to everybody! I am convinced anyone can draw or sketch, let me show you how easy it can be! I hope you enjoy my sketches, I still have a long way to go but that's part of this fun experience. Here's a page describing the difference between drawing and sketching plus I show you some sketches from the start of my learning to sketch journey. 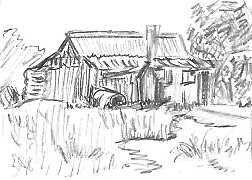 Really sketches are only a combination of simple lines, as familiar as common words. It's so easy and anyone can do it. Do you have a lot of trouble drawing a circle? I practice drawing circles a lot and I've produced some shockers! I've discovered if you draw a circle first by going around a lid or a round object, you will get the "feel" of the circle and the type of stroke needed. As soon as you do that, draw another circle freehand. It's better than before, isn't it? 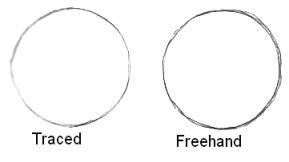 I drew my freehand circle in a series of arcs. I also turned the paper around so that I was drawing the arc in the same position. As you can see, I kept practicing my strokes going around the circle. It's an interesting exercise so I hope you benefit by it just like I did. If you are teaching yourself to draw, there is a variety of terrific online art books available that just might suit you. There's no risk involved because they all carry a money back guarantee if you're not satisfied. For common drawing questions, visit the frequently asked questions page. To become a friend at allaboutdrawings.com, please find the Friend Connect box that appears towards the bottom of the right column on the home page. Another way to stay up to date with the latest developments on the site is to sign up for the Drawings Blog by RSS feed. It's really quick and easy! , thank you for taking the time out of your busy schedule to read this issue. Have many happy creative days!